Many of us want to have beautifully radiant skin that we are willing to pay for a professional or salon chemical face peel treatment on a regular basis. But not all of us can afford pricey salon visits. The solution? A do-it-yourself chemical face peel! An at home acid peels treatment is going to cost you way much less than a salon peel. As to the effectiveness, you may be able to get comparable results depending on the condition of your skin, what problems you are trying to correct and also provided that you do it properly. Check out the video below for some tips to getting your peel right the first time. 1 Why do You Need a Chemical Acid Peel? 2 Is a Chemical Facial Peel Right for You? Why do You Need a Chemical Acid Peel? If you have an acne problem, aren’t happy with your wrinkles or you’d just like to do a very thorough cleaning of your face then an acid face peel is probably an excellent idea. Although a bit harsh on your skin initially the results of most face peels is usually more even skin that is smoother and has less noticeable wrinkles and can help reduce the skin problems caused by aging and sun damage. Face peels can also improve the appearance of some mild scars and are an excellent treatment for many types of acne. Not only that but they can help to reduce freckles, age spots and melasma or dark patches on the skin that can sometimes be caused by taking birth control pills or pregnancy. Also our skin is exposed to different kinds of pollutants every day. While the skin is able to peel naturally, the assault is sometimes too much for the skin to handle. This is why our skin needs a little help through acid peels. Age – As we grow older, the skin starts to lose its elasticity and capacity to generate new skin. As a result, the outer layer of the skin becomes a sheet of old skin. Hiding behind this old skin is a new and more beautiful skin, and this will be visible only after a face peel procedure. Stress – Stress makes the skin age. Stress affects the hormones as well as the mechanisms of the body including skin generation. Yes, poor skin is a symptom of stress! Dehydration – Water keeps the skin supple and beautiful. If you are dehydrated, your skin will be dry and will have a hard time peeling on its own. Make sure to drink lots of water daily! Lack of sleep – Sleep is very important for the skin. During sleep, the skin is able to regenerate and replace the old ones. Without proper rest, your skin will probably look old and worn out. Improper diet – Diet is very important in maintaining healthy skin. If you eat unhealthy foods then most likely your skin will reflect this as well. You get the picture? While your skin is capable of peeling by itself, it still needs some help because of these factors. Make sure to get a face peel at least once a month for best results! Is a Chemical Facial Peel Right for You? If you’re thinking about having a face peel here are a few tips that will help you to determine if this beauty procedure is for you. If you are fair skinned and light haired you are a better candidate for a face peel. People with darker skin can have good results but they also have a tendency to have uneven skin after the face peel is finished. If you have large bulges, severe wrinkles and skin sags a chemical peel might not be right for you. If you have a history of scarring, facial x-rays or cold sores that keep coming then a face peel might not be the best option for you. Face peels can be done at different skin depths. To have a successful peel you need to find out which is the best peel for your face and skin type. What is the current condition of my skin? This is the most important thing that you have to consider when getting a face peel. Is your skin inflamed? Is it irritated? If that is the case, then it is better for you to not proceed with the procedure. Going on with the procedure despite your condition will more likely make things worse. Am I allergic to any of the ingredients? For instance, if you are allergic to aspirin then you should not get a salicylic peel. What skin problems do I intend to treat? Before you undergo any procedure, identify first what problems you wish to treat. Is it an uneven skin tone or sun damage? This will help you determine the type of peel that’s the right fit for you! How often do I need a face peel? Overdoing a face peel, i.e. daily face peel, can do you more harm than good. Remember that the skin is capable of peeling in itself and you only need to help quicken it. Just peel moderately and you’re good! Skin types also need to be considered. This is especially true for dark-skinned individuals because peeling can sometimes cause hyperpigmentation. Because of this, you need to make sure that the chemical is suited for your skin. TIP! 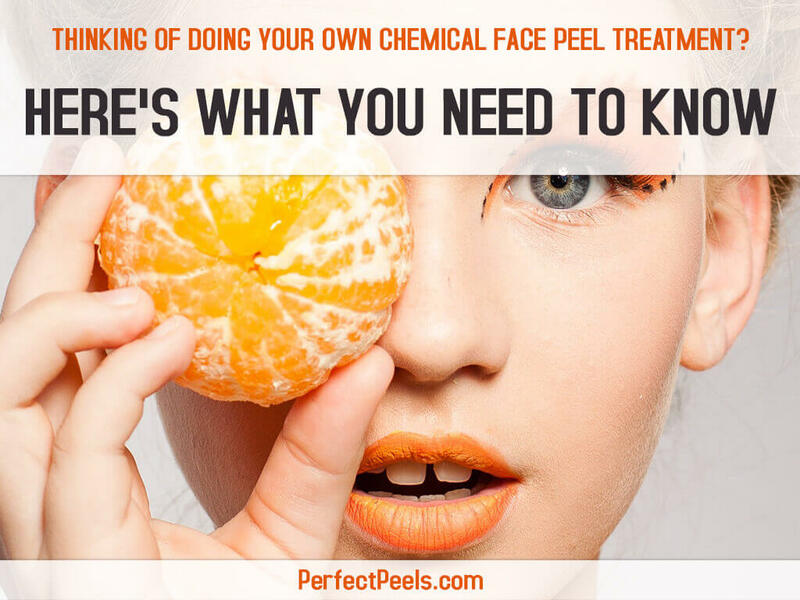 It is recommended that if you have never done a peel before you should stick with the lower percentages to see how your skin will react. Salon services can be quite expensive. If you are one of the people who want a salon-like face peel but can’t afford one, then you can try doing your own chemical acid peels. Doing it on your own helps you save as much as half the cost of the salon-priced peel! 1. Lactic Acid Peels (40%-70% concentration) – Ideal for treating sunburns, this nourishing peel is generally used for sensitive skin. Start with 40% concentration and test the results. If later on your skin becomes resistant to 40%, increase it by 10% and so on. Just don’t exceed 70% and you will be fine. 2. Mandelic Acid Peels (25% concentration) – This is recommended for people who are prone to forming brown spots or blemishes. It can also tighten the pores after use. 3. Salicylic Acid Peels (20% concentration) – Salicylic acid is very popular for its anti-acne properties. If your skin is prone to acne, this is the peel best suited for you. 4. Glycolic Peels (20-30% concentration) – This is recommended for people who have uneven skin tone and rough skin. For first time users, 20% concentration is recommended, but you can increase it as your skin gets used to the treatment or if there are no side effects. 5. TCA (Trichloroacetic acid) Chemical Peels (25% concentration) – This peel is good for treating fine lines and signs of aging. This is sometimes paired with lactic acid for optimum results. For starters, a 15% concentration is recommended as well as minimal sun exposure in the next 2-3 days following the application. TIP! The key to a perfect peel is to choose the right peel for your particular skin problem and skin type. Avoid sun exposure – The skin is particularly fragile after a face peel, so make sure that you avoid sun exposure. Do not go out in the open especially during 10 in the morning until 4 in the afternoon. It is during these times that the sun is more damaging to the skin. Drink lots of water – Keep your skin hydrated all the time by drinking at least 8 glasses of water daily. Apply moisturizer twice a day – To further protect your skin from unwanted damage and pollutants, make sure to apply moisturizer twice daily in the morning and before you go to sleep at night. Use sunscreen – There are times when you can’t help but go out in the sun. In these cases, make sure that you wear an SPF 30 sunscreen to protect your newly peeled face. Wait for a few weeks before undergoing another procedure – Do not just jump from one procedure after another! Make sure that you give your face a break before undergoing another facial procedure. Have an interval of at least 1 month after every procedure. You can expect varying degrees of side effects, depending on the type of chemical peel that you choose. If you’re going for a mild peel using glycolic acid for example, you may experience slight itching and a burning sensation on the affected area. If you’re thinking of getting a moderate peel with salicylic acid, you can expect some level of redness and swelling once the chemical solution has been applied. TIP! Always do a patch test prior to the full facial peel. Just like a coin, getting a do-it-yourself face peel has two sides. Discover the major pros and cons of getting a DIY face peel! Cost effective – It cannot be denied that salon face peels are more expensive than DIY ones, if you’re on a budget this may be the way you decide to go. Some people are very happy with the results as much as they are happy to save some money. After all, who wouldn’t want to have beautiful skin at a lower cost? You can choose which ingredients to use – Because you will be the one in charge of everything, you can choose which ingredients to use in your face peel. What’s more is that you can control ingredients which may trigger your allergy. This way, you’d feel more comfortable about the procedure. Safety – The biggest drawback with carrying out a chemical peel at home is the safety issue. It’s essential you read and follow the instructions carefully as improper mixing of the chemicals, or leaving them on too long will harm your skin. Time consuming – It can be more time consuming for you to apply the solution to your own face especially if this is your first time doing it. Chemical acid peels can give your skin a new lease on life, but caring for your skin every day is also a very important part of retaining a younger, healthier looking you. Neglect is one of the major causes of ageing skin, and it must be emphasized that having a chemical peel is a waste of time if, in the long run, you do not look after the nourishing and protection of your skin. Daily cleansing and moisturizing, at least twice a day, will help you to retain a smooth and glowing skin, as will the application of sunscreen and a good healthy diet. So You Want to Do Your Own Salicylic Acid Chemical Peels?